Like many of my friends, I use the E-Ink screen of Yotaphone 2 for navigation. Would it be possible to have roadside widths to better see the roads as on another GPS we use, see picture. Comme plusieurs de mes amis, j'utilise l'écran E-Ink du Yotaphone 2 pour la navigation. 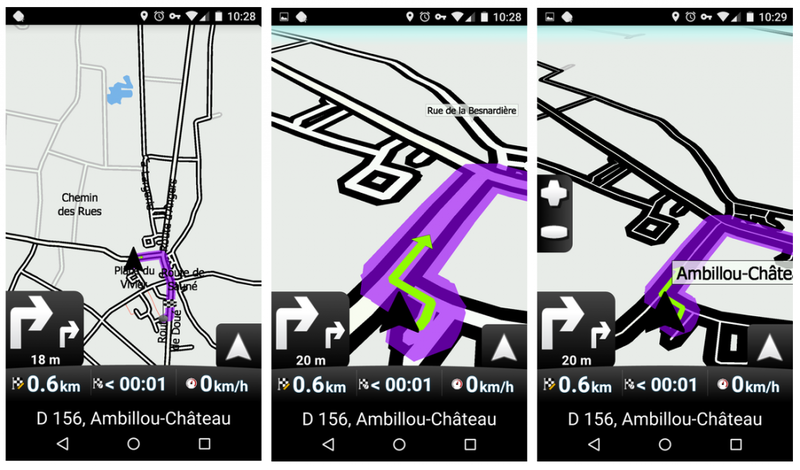 Serait-il possible d'avoir des largeur de bord de route afin de mieux voir les routes comme sur un autre GPS que nous utilisons, voir image. What is the other navigation app?? 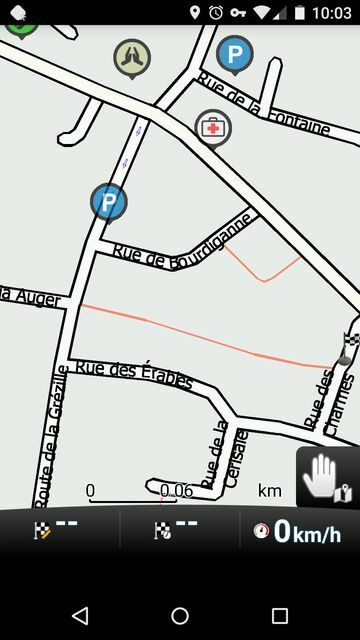 One of the nice features of mapfactor (android version) is that you can customize the map scheme's. In the settings - map customisation you can choose different scheme's. Perhaps one of these screens is the right one for you. Bu you can also edit many aspects of a map scheme: global - text - line - area. In the line area you can change the way the roads look. But be careful. The number of possibilities is huge so it is very easy to make a mess of it. 1. choose the scheme that you like the most. 2. clone this scheme and rename it to test. 3. experiment in this test scheme. the menu edit the color palette does not work on the beta !? No, I will take a look on it on monday. Read "Test of android version 3.1.x"
In the file "album.style" what should I change as a value or parameter for the width of the road edges? would it be possible to add this option of line width of road borders? like the other gps in the first post of this topic ? "getDefaultDisplay())" is the default screen ? On yotaphone, the default screen is O-Led screen, E-Ink screen is the second screen. @MacDony I am not sure why did you send me xda forum link - there is nothing what can help me. Default screen can be the issue. The problem is that there is no API to detect which display is active. I gave it up. I made workaround in version 3.1.80+ that if you create file or folder "eink" in Navigator folder it will force the eink configuration. on the xda forum, some have made applications for the e-ink screen. I thought there would be useful information. 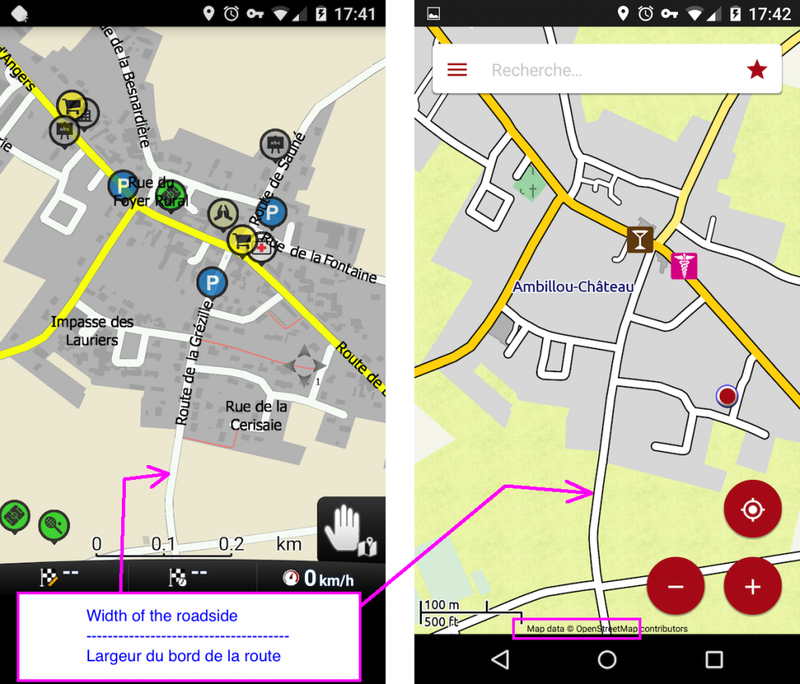 Folder "eink"in "\Android\data\com.mapfactor.navigator\files\navigator" or "navigator" ? Lubos, you are a champion ! Is it possible to have the dashboard in Black and White and not in Gray Level in E-Ink mode ?! There is no zoom large enough to navigate in 2D mode. In 3D mode the width of the road edges is increased with the zoom. It seems I made mistake in rescaling road borders. It will need a bigger code review and we are already releasing 3.1.92. I will try to fix it in future version.